A bomb ripped through central Bangkok close to the Erawan Shrine on Monday 17 August, killing 20 people. According to officials, 12 of whom died at the scene. More than 120 people were injured. The news saddened my heart and the World. I felt we can only look forward from this point. I consulted the Tarot cards for consolation and guidance. You can also time-travel backwards. From “Tarosophy Squared”, forthcoming in 2016. I pulled 3 cards from the Impressionist Tarot deck to have a glimpse of the future and asked about the implication of this tragic accident to the Thai people. Card 1 (left) – what does this mean to Thailand now? 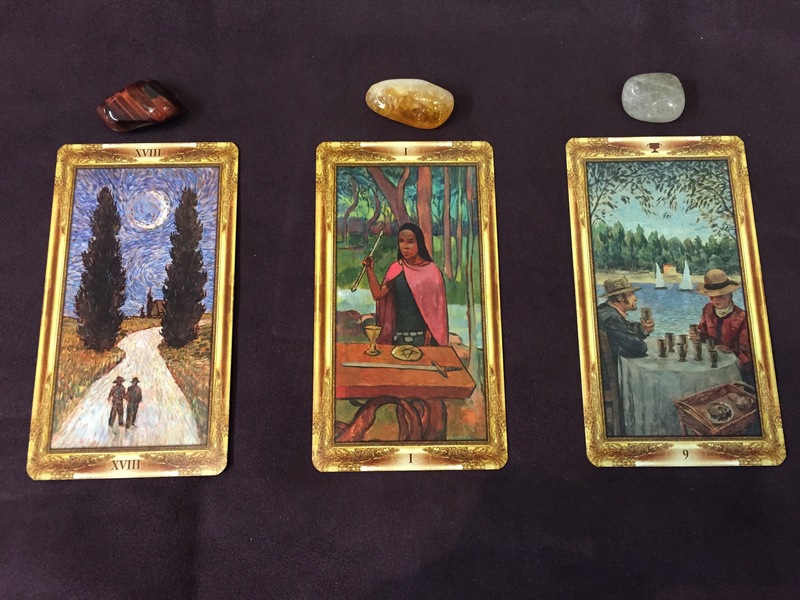 Card 2 (middle) – what does this situation mean to Thaliand in a year? Card 3 (right) – what does this situation mean to Thailand in 2 years? Card 1 is the Moon. At the moment there is a lot of fear within the country. It has not been clear who did this and whether there will be more bombs coming in. Moon also represents the people: they are worried and haunted by the unknown. Card 2 is the Magician. In a year’s time people will be able to transform the experience into something useful. The Thai people are creative and positive tribe, I am very happy to see this card appears as it foretells the country has the ability to build on the experience and make it a better place. Card 3 is 9 of Cups. In about 2 years time people will be living in serenity. They will put the tragic experience behind. The card looks exactly like a holiday place where people are having a good time. All will be well. Brightest Angel blessings to the country and the people. I wish all of us will be back to Bangkok for holiday soon. This entry was posted in everyday, Tarot and tagged 9 of cups, impressionist tarot, moon, the magician on August 22, 2015 by The Magician.